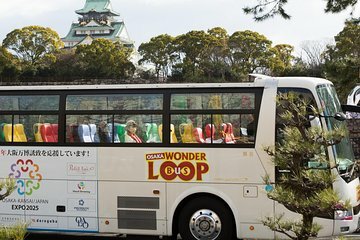 See the sights of Osaka with a hop-on-hop-off tour over two consecutive days by bus and boat. Just book online and select a 2-day ticket with either a 1- or 2-day subway pass to help you get around the city with ease. Travel to landmarks such as the Buddhist temple of Shitennoji Temple and Osaka Castle, and explore neighborhoods like Umeda and Shinsaibashi at your own pace. Complimentary Wi-Fi is included on board the bus, so you can post photos as you travel around. Bus service starts at 9am and ends at 8pm seven days a week. Check website schedule for details. For the cruise, please check the official website for cruise map, departure times and maintenance days (the cruise is not available on maintenance days and when conditions require to take the cruise out of service). The cruise is very popular and to guarantee a seat on the boat a reservation is required. Please see official website for reservation details. Children under age 6 (who do not require their own seat) may travel free. The bus has no bathroom facilities and minimal storage space; only one item of luggage per passenger is accepted. Eating and drinking is not permitted on board. On rainy days the open top bus uses a retractable roof. In case of sudden rain, temporary rain covers will be provided. Open umbrellas are not permitted for safety reasons. One open-top with retractable roof and one closed-top bus with AC/heater in service. The service may be suspended or the route changed in the event of traffic accidents. Please check the official website for information regarding maintenance days for the cruise boat. The cruise will not be available on maintenance days. The cruise is very popular and it is strongly recommended to make a separate reservation for the cruise on the official website.